Last stop on our brother and sister tour: Bangkok! We headed back to the Thai capital for a packed weekend before heading our separate ways. 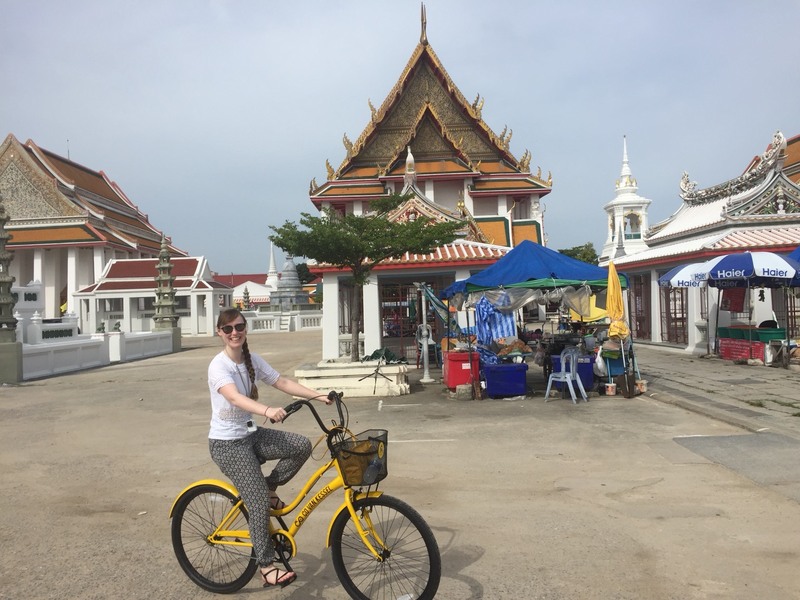 We got up at the crack of dawn to join a “Bangkok by bike” tour by Co Van Kessel. This company runs a variety of cycling and boat tours that aim to show you the “real” Bangkok. We opted for the 5 hour bicycle and boat combination tour that starts in the morning so that we would see the markets in action and also so we wouldn’t be cycling during the hottest part of the day! 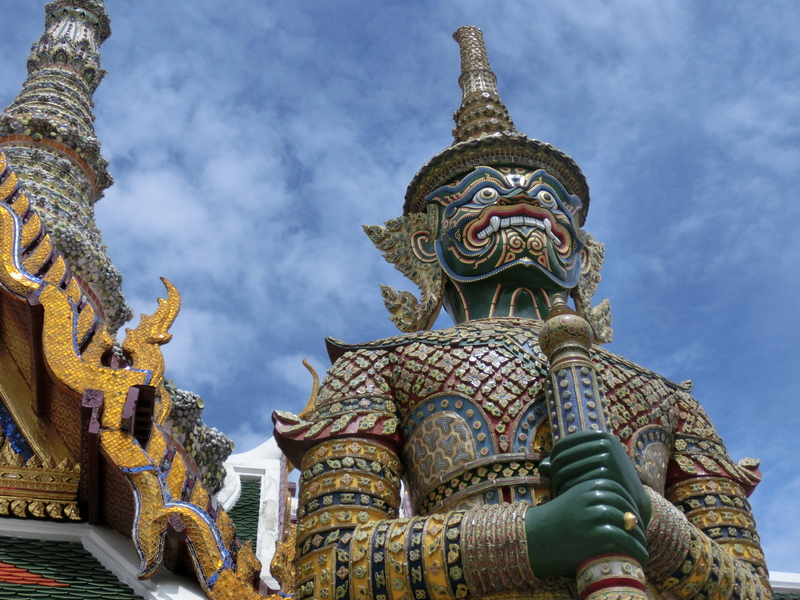 I would highly recommend you start any first-time visit to Bangkok by doing this tour – it’s a fantastic way to get your bearings and see more of the local sights. Our tour started with us going through China Town and weaving our way through back streets until we got to Pak Khlong Talat flower market. Here we parked our bikes to explore the inside of the market and also to stop at some of the many food stalls to sample the local fruits and snacks. 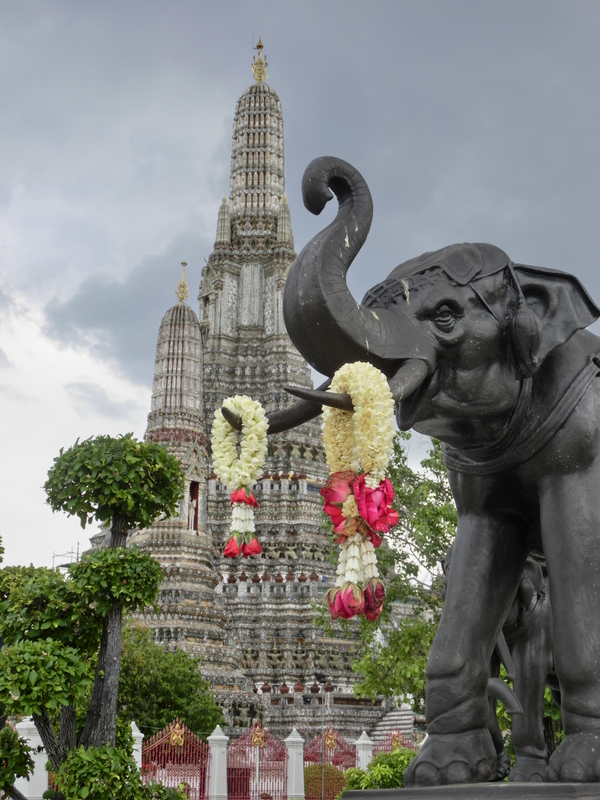 With our sugar levels boosted by the sweet treats, we headed over to Wat Chakrawat, aka “The Crocodile Temple”. A few years ago this area of Bangkok flooded badly during the rainy season and there were a couple of crocodiles that got a little too close for comfort, so the locals penned them into an enclosure in the ground of this temple to prevent them hurting anyone. You can still see them chilling in their little lake. After this stop, we pedalled through a few more small temples until we were back beside the river again and could board our boat. 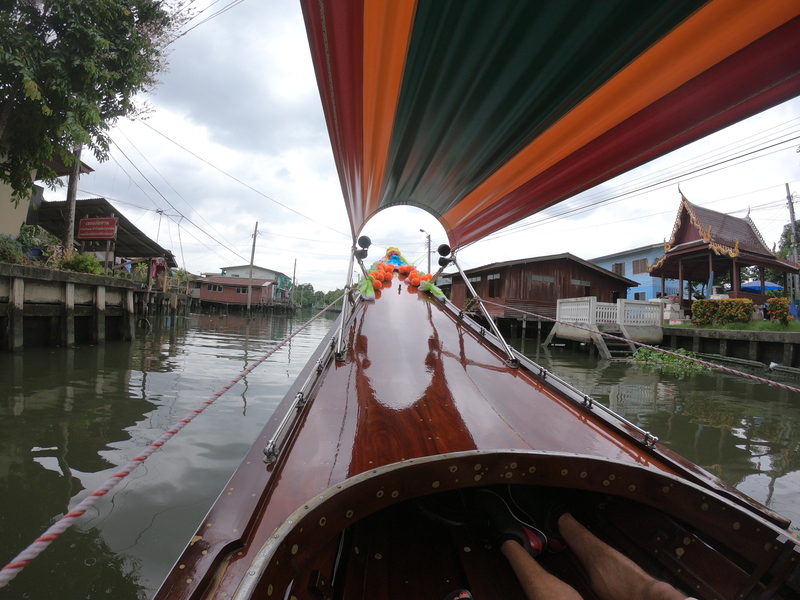 This beautiful traditional teak longtail boat whisked us through the many canals (Bangkok is known as the “Venice of the East”) until we were in the suburbs. Here we got back onto land again and began to cycle through the many floating farms and houses on stilts. We stopped at a few temples on the way, where there were many monks performing morning prayers. After exhausting ourselves with more cycling, we stopped at a local restaurant for a very tasty multi-course lunch – the more we ate, the more food kept coming! Feeling much heavier, we got back on the bikes to make our way back to the boat which was waiting for us in one of the larger canals. 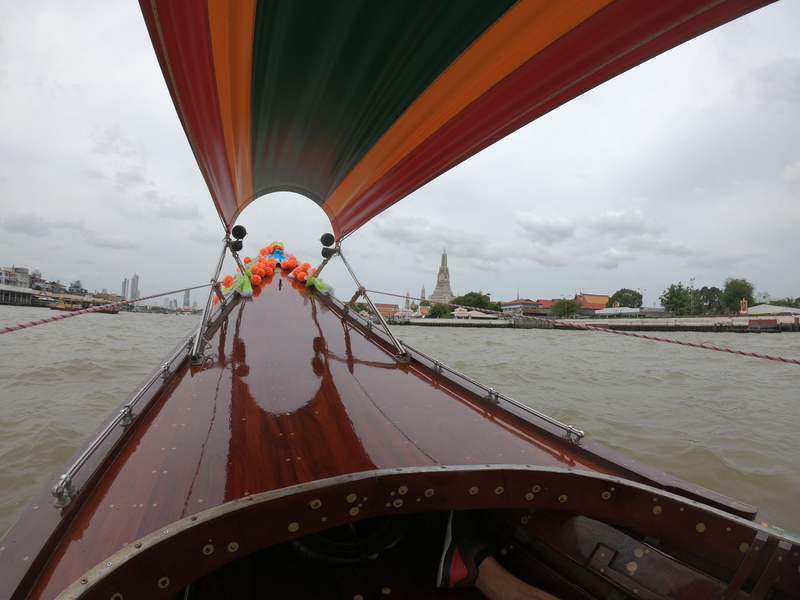 We then headed back to the choppy Chao Phraya River that runs through the heart of Bangkok, sailing past Wat Phra Kaew, The Grand Palace and Wat Arun Ratchawaram on our way back to the starting point. We then spent the afternoon exploring these main attractions. Note that you need to cover your legs and shoulders (so no shorts or vest tops) when visiting the larger temples; it’s also polite to do the same for smaller temples, even when not enforced. Most of them will hand out sarongs for free or a very small charge once you’re inside, so do not fall for the scam artists who stand outside the temple complexes and try to charge you a lot for clothes to cover up with. Also don’t believe the people who wait around the corner from the main attractions to tell you that “the main gates are closed, but I know a side entrance…” as this is another scam. Basically when you’re in Bangkok, employ common sense and don’t believe anything that random people tell you, as it is very likely to be a scam. 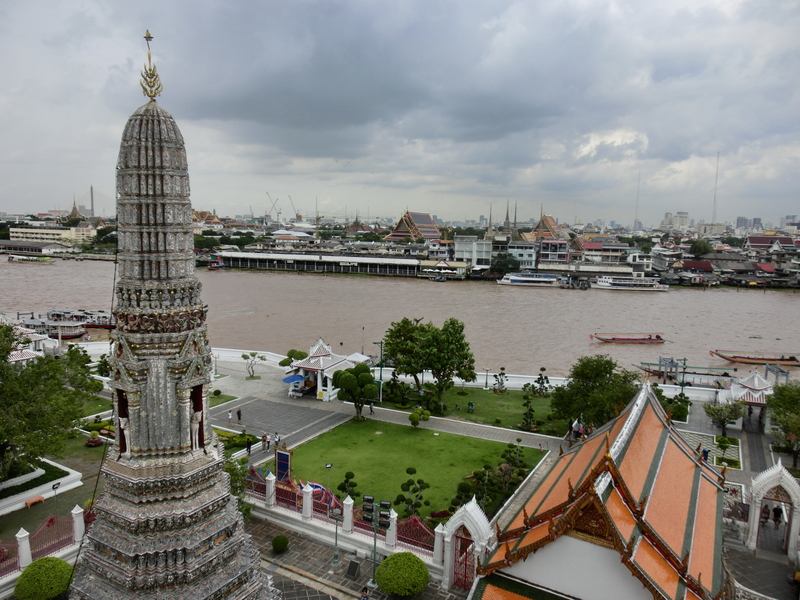 We started at Wat Arun Ratchawaram and climbed up the stairs to see the view of the river from above. 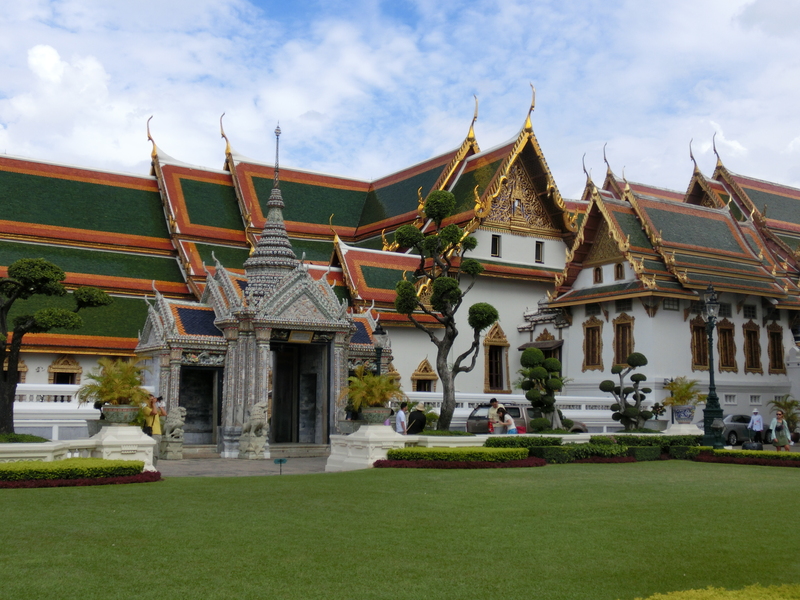 Then we headed back over to wander around the Grand Palace complex and Wat Phra Kaew. We were lucky to make it in time to still see the giant reclining Buddha statue, but unfortunately didn’t get to see the famous Emerald Buddha as the last entry to that hall is at 3pm – go earlier than we did to avoid disappointment! The buildings were still stunning from the outside, so we still managed to enjoy the afternoon. Later in the evening, we headed over to the infamous Khaosan Road to see all of the backpacker bars in full swing. This is the street where you can buy cocktails in plastic buckets (full moon party style) and also stock up on last minute souvenirs and clothes from all the market stalls. 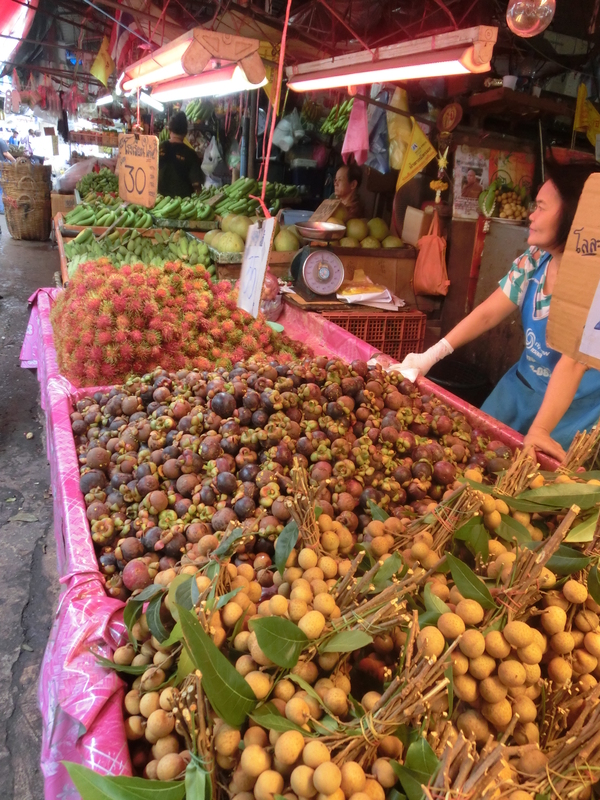 We had fun walking up and down surveying the scene, and then headed to the neighbouring Soi Rambuttri for some excellent street food – this street is a much more chilled out and more local alternative to Khaosan. There are many restaurants to choose from if you don’t like the idea of eating from a stand in the street, but the best food in Bangkok can be found by pulling up a plastic stool to a food cart in the street! Most stands show photos of the food so you can just point to order what looks good. Or, check out which dishes the locals are tucking into and order the same. We finished with a night cap at one of Bangkok’s famous roof bars. Both Moon Bar (on top of the Banyan Tree Hotel) and Sky Bar (on top of the Lebua by State Tower Hotel) offer panoramic views of the city at night. The following morning, we continued our food-heavy weekend and joined the hilariously named “Cooking with Poo” class. Poo (her nickname from a young age, which doesn’t have the same connotations in Thai as it does in English!) is the owner of this cooking school that is based in a very poor slum area of Bangkok. Along with her family and friends, she set up this school which provides jobs for the local community after she struggled to make ends meet just by selling food from her house. 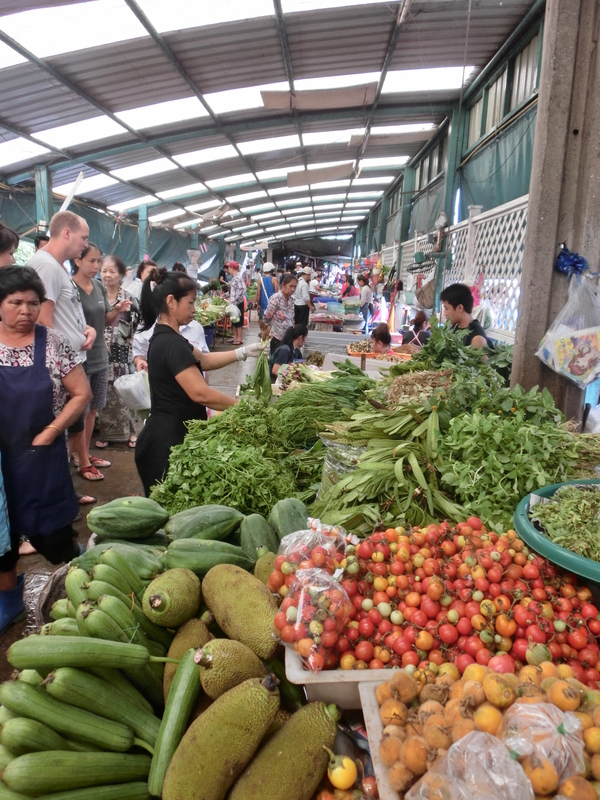 The class started with a trip to Khlong Toei Market to pick out our ingredients for the class. This HUGE local market is filled to the brim with the most amazing spices, vegetables and (very live) livestock, and the teachers spent time showing us how to pick the freshest and best quality versions of everything. Once back at the cooking school, we started to learn how to prepare each course. We started with yum som-o (pomelo and chicken salad), then tom kha gai (coconut and chicken soup), followed by a healthy oil-free pad thai (noodles with shrimp), and finished everything up with khao niao mamuang (everybody’s favourite mango sticky rice!). Every time we finished a dish, we took a break to taste what we had cooked, and by the end of the class, we were totally stuffed! I cooked with Poo and I liked it! The only thing we were able to do after eating that much food was to lie down for a relaxing massage at a spa near our hotel, before having to head to the airport for our flight home. How to get there: Suvarnabhumi Airport, Bangkok’s main international airport, is a hub for Asia, so there are many international flights every day. You can take the Skytrain from Suvarnabhumi Airport into the city, or if you’re flying into Don Mueang Airport then it’s easy to take a taxi (make sure to ask them to put the meter on). 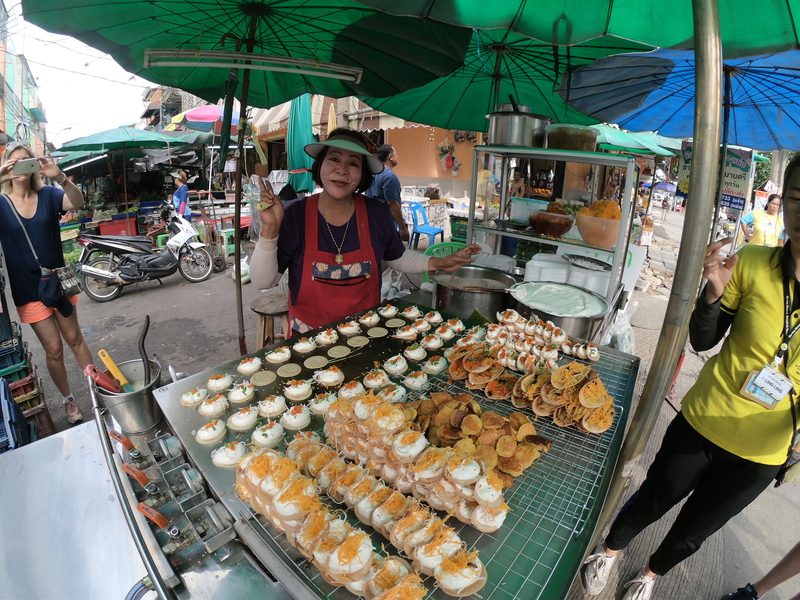 Holly’s top tip: skip trying to find a good restaurant and eat the street food – it’s safe, delicious, and incredibly cheap!